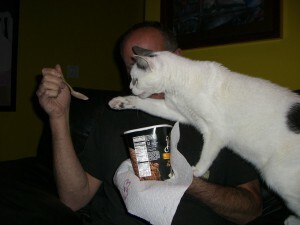 It is OK for the Dog and Cat to share your Ice Cream? Ice Cream, you scream we all bark or meow for ice cream! Lets face it we like to think our furkids deserve the same treats we give ourselves. Many online articles say that a lick or to is just fine, but not a whole bowl of their own. I lean more towards no. 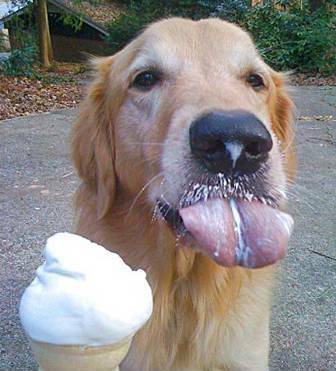 Many dogs and cats are lactose intolerant and that small ice cream cup can be big potty trouble later. If you most share (because those sad eyes are to irresistible), for the first time give them a small scoop and see how they react. Also be mindful of the ingredients. Chocolate and raisins are always a big no no, but to much sugar can cause blood glucose levels to spike. Check for artificial sweeteners like xylitol which are toxic. Remember we make the decisions for our furkids when it comes to their nutrition, lets make health choices. You and dog can enjoy some frozen blueberries or banana slices. Give it a try you might like it.